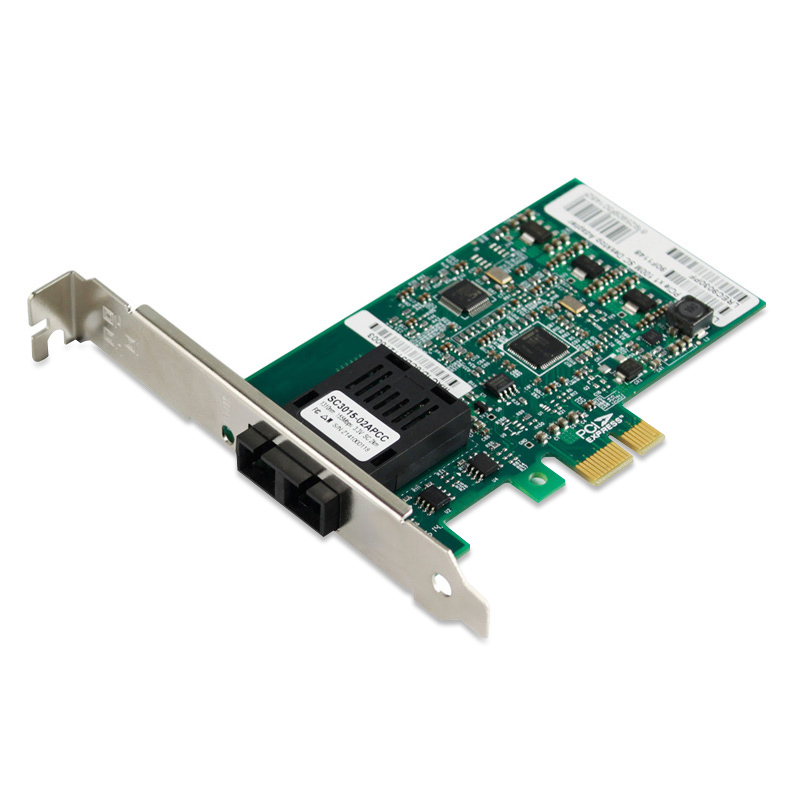 NIC-9030PF-LX is a PCI-E managed 100Mbps fiber fast ethernet lan card. It's also the first modle PCI-E x1 slot fiber fast ethernet nic card which used the Intel chipset. With 1x9 optical transceiver module, it can be matched with different fiber connector or optical transceiver module with different transmission distance according to the requirement of users. The fast ethernet lan card can offer users reliable fiber-optic link on fast ethernet internet, particularly it is fit for places where distance of accessing to POI beyond string Cat 5e (>100m). It can completely replace the networking structure of that Ethernet card with RJ45 port connects externally optical transceiver. It can provide users with reliable FTTH and FTTD solutions. Users can select the optical interface parameters (including connectors, single-mode / multi-mode fiber, working distance,etc) according to occasion. For PCs with PCI Express (PCIe) slots, the NIC-9030PF-LX Desktop Adapter offers the newest technology for maximizing system performance and increasing end-user productivity. Specifically, the Intel Gigabit CT Desktop Adapter uses auto-negotiation to ensure the adapter runs at the highest available network speed (10 or 100 Mbps), and it maintains full bandwidth capacity with the dedicated bandwidth of a PCI Express input/output (I/O) bus to provide connectivity you can count on. Based on the low-power Intel 82574L Gigabit Ethernet Controller, this desktop adapter offers optimal performance in a low-cost, low-power, compact profile. Teaming support and an array of other advanced features enable customers to utilize this adapter as an entry-level server adapter as well. Fast servers and server connections are important for high network performance. However, server speed cannot overcome the drag of slow desktop performance. When a desktop PC initiates a transaction with the network server, the server quickly performs its portion of the transaction, but must wait for the desktop PC to complete its part of the transaction. The slower the PC, the longer the server must wait for transaction completion before moving to the next transaction. With PCI Express Gigabit performance to the desktop, transactions on the PC side complete significantly faster, allowing the network to service more transactions faster. PCI Express is the third-generation I/O standard with performance that supercedes the previous PCI and PCI-X- slot standards. The key to PCIe performance is its higher dedicated I/O bandwidth. Unlike the PCI bus, which shares its I/O resources with all devices on the bus, PCIe dedicates its I/O to a single device. The NIC-9030PF-LX fast ethernet nic card allows you to take advantage of this dedicated I/O by combining Gigabit Ethernet with PCI Express to provide high-performance network connectivity for desktops with PCI Express slots. Make the Intel Gigabit CT Desktop Adapter your choice for applications utilizing rich media content such as video streaming, web applications,music, and gaming. The NIC-9030PF-LX fast ethernet lan card is supported by Intel PROSet Utility for Microsoft- Device Manager and Intel PRO intelligent install. Intel PROSet simplifies adapter installation and gives you point-and-click power for configuring and managing all of your Intel Network Connections.